INDIANAPOLIS (Oct. 22, 2015)  It's not too early to set your sights on summer 2016. As the fall season for high school and college marching bands nears the end, drum and bugle corps are already looking ahead to next year. Units that compete on the Drum Corps International summer tour will hold auditions for prospective members in November and December. More than 40 competitive DCI corps are located throughout North America, representing more than 20 states and several Canadian provinces (see the corps links below). The geographic spread from coast to coast means there is almost certainly a corps based in your region. And with the emergence of DCI's SoundSport program, there are additional opportunities to march with units that carry lower tuition fees and lighter touring schedules. Check It Out  If you're not sure whether marching in a DCI corps is for you, attend an audition camp to experience corps life first-hand. At the very least you'll learn some new techniques and meet a lot of people who share your passion for marching. Location, Location, Location  Corps typically rehearse at least once per month throughout the winter. Before committing to a corps far across the country, consider whether you can afford plane tickets to attend rehearsals. You may want to choose a corps that's within a reasonable driving distance. Consider carpooling with a friend so you can share expenses. Start Saving Now  Every corps relies on membership fees to operate the organization and cover the costs of equipment, instruction, buses and food. Develop a plan to save money so you can pay your dues promptly. If you fall behind on payments you could lose your spot in the corps. 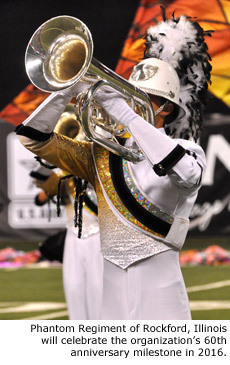 DCI's competitive rules allow performers to march until they reach age 22. To march during the 2016 season, you must have been born on or after June 1, 1994. (You can still compete if you turn 22 in the midst of the summer season.) If you're over the DCI age limit, consider marching in an all-age corps affiliated with Drum Corps Associates. • Phantom Regiment (Rockford, Illinois) will celebrate the organization's 60th anniversary in 2016, with special events including a reunion gathering and alumni corps performance. • The Madison Scouts (Madison, Wisconsin) will spend the first two weeks of their tour in California before returning to the Midwest. This will be the corps' first visit to California since 2007 when the DCI World Championships were held in Pasadena. • After a successful first season with a ninth place finish at the DCI Open Class Championship Finals, River City Rhythm (Anoka, Minnesota) is planning a return trip to the DCI World Championships with an even larger corps in 2016. • Southwind (Mobile, Alabama) is looking forward to another year of reestablishing the corps, after successfully making the transition from SoundSport to Open Class last season. Below are website links for DCI World Class and Open Class corps, organized by region. Check the individual sites for audition details and to register. 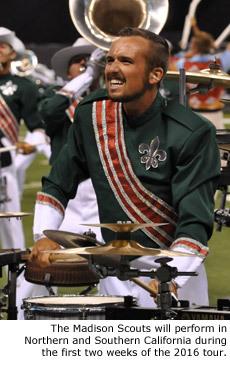 Also visit DCI.org/audition for more information and tips about the audition process.